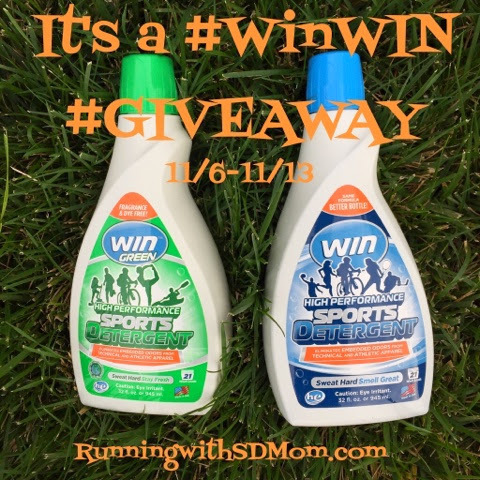 Running with SD Mom: #Runch time, Stinky Clothes and a Win WIN GIVEAWAY! #Runch time, Stinky Clothes and a Win WIN GIVEAWAY! Disclaimer: I received 2 full sized bottles of WIN detergent for review purposes as part of my ambassadorship with SweatPink. I was not requested to write a positive review. All opinions are my own and I have received no monetary compensation for this post. If you follow me on Instagram, you know I like to post about my Runch time. Runch is defined as the time you SHOULD be taking for a lunch break but end up running instead. Get it? Run instead of lunch = Runch! I thought it would be fun to show you the things I have in my Runch bag. Here is what else I keep at work to complete my Runch kit. 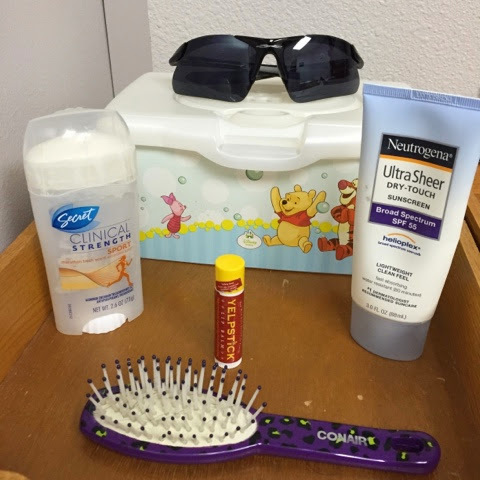 Wipes, deodorant, chap stick, sunscreen, hair brush and sunglasses. All essential Runch tools. Well, when you are Marathon training and have your sweaty moist clothes trapped in your small Runch bag, it's going to take a lot to get the stink out! Thank Goodness, I was given the opportunity to try out WIN Detergent specifically geared towards tech clothes and getting the stinky sweat out. Not only do they have a bottle with a fresh scent (blue cap), they also have a green bottle which is free of dyes and fragrance. In other words, one I am happy to use for my sensitive son's stinky boy clothes. I have been using the detergent on my Runch and long run clothes for about 3 weeks now and I can tell you, they smell fine! Fine because they are fragrance free. No bad smells, just no smell at all. 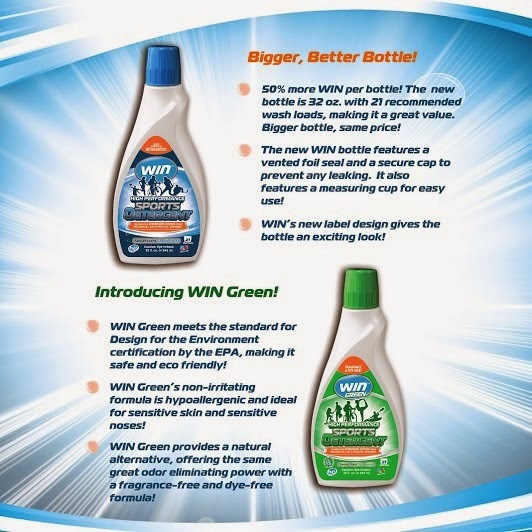 Now for the good news: You can get $1 off any bottle of WIN detergent using code WINGIVE1. For the even better news? WIN Detergent is letting one of you WIN two bottles of FULL SIZE WIN Detergent too. 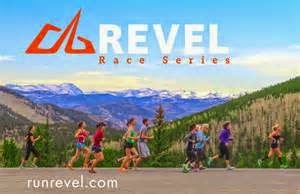 Get your Runch and long run clothes un-stunk! Now you can #SweatHardSmellGreat, no problem! Enter to win on the Rafflecopter widget. No purchase necessary. Void where prohibited. 1 winner will be selected via the Rafflecopter widget. Open to Residents of the United States 18 years of age or older. Winner must have a valid email and mailing address. All winning entries will be verified. If a winning entry cannot be verified as completed, a new winner will be drawn.Winner will be provided the prize directly from WIN Detergent. Substitutions unlikely but may apply. SD Mom not responsible for damage that may occur during shipping of the product. So tell me, do you Runch? Do you let your clothes get stinky or do you wash them right away? I'm a stay at home mom so I don't Runch. I usually go run right after I drop my son off at school. I try not to let my clothes get stinky. I have these tank tops from Athleta that actually have natural silver salts in them and they call it their unstinkable material. No funk yet so it must be working plus I love the fit of the tanks. I don't runch (only because I don't take a lunch ;)). I either run EARLY morning or after work. I haven't found a good detergent yet, so I'm really hopeful this stuff works!! In the winter time, I commonly RUNCH. I don't like running in dark and cold and there are a couple of 3-4 mile loops around campus that are doable during lunch. I have also been pool jogging during lunch which has been nice. I take a shower afterwards but more just rinse the chlorine off kind of thing. My co workers all know I run so they don't complain too much when I am sweaty and gross LOL! I have been washing my clothes on cold and then hanging them up to dry and that has helped with the stink issue. I use tide and add vinegar to the wash. Helps a lot. 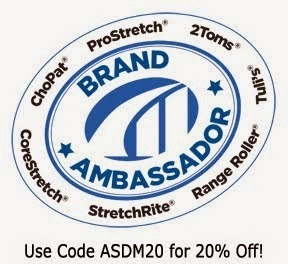 Would love a sample, awesome giveaway! I usually leave my clothes out for awhile and rewear them if I can... they do wind up smelling something fierce after awhile!! I don't runch, I prefer to run early if I can. I've tried everything to get rid of stink! I wash in cold, I hang dry, I even tried soaking in vinegar for awhile, but honestly none of it really takes it all out for me. Interested to know if this detergent really does the trick! I only have 30 minute lunch so when I have time I run during lunch. I change my clothes out everyday if I'm going to run a few day in a row. I don't really have a lunch, as I'm a social worker, so no runch for me. I use Tide Sport right now, along with dryer sheets. Sometimes those purex crystals too. ..haha! I run early in the morning if possible. I don't wash my clothes right away but within 24 hours -- with five active people in the family I do at least two loads of laundry per day to keep up! I would love to try the green detergent! I don't have a good detergent. :) I will run at my hubbies lunch if he can come home and take the kids or I'll run when i can with them in tow. I don't runch. I have an awesome flexible schedule so I eat at my desk and leave early. I've been having good luck with the Tide for fitness clothes for my own workout clothes but some of my husband's need a few washes. So glad no one on here knows him to rat me out for sharing that! I exercise at the gym and just get dressed before I go. I avoid excercise like the plague! My lunch (when I remember to eat) is usually taken in my car between clients (I'm an in-home family therapist), so I don't Runch. i use vinegar to get the stink out of my clothes. It works! I have mine in a duffle bag. 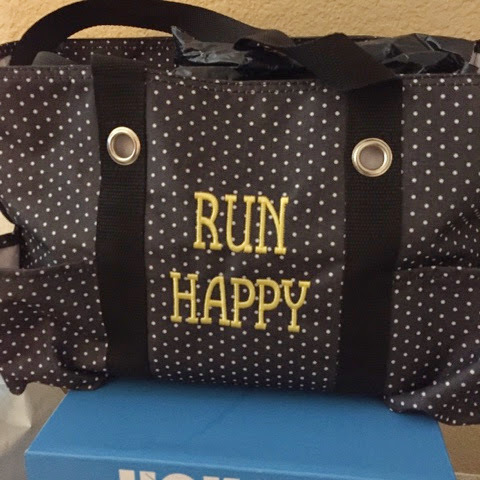 I mostly run at home so I don't have to keep extra clothes/shoes in mine but I do like to keep all my running related gear in one place so if I do decide to go run with a friend it's all together and ready to go! I don't runch. Sometimes I do run after work with a coworker and I have a gym bag that I use. 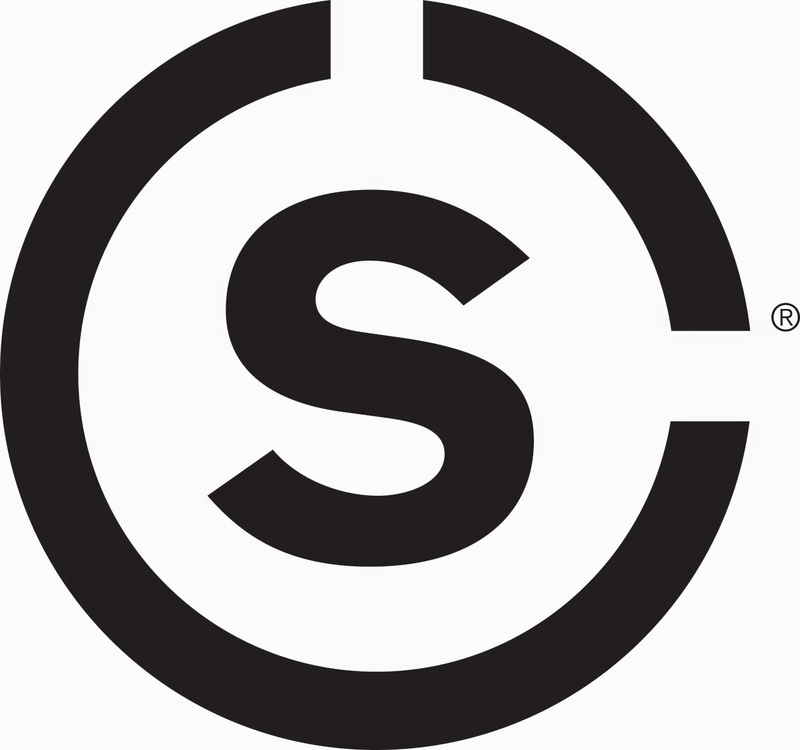 Can't remember the brand right now. For stinky clothes, I use Oxiclean. I don't runch - I go out before breakfast. So far I use regular detergent for my clothes. I don't runch since I run right when I wake up, but I always see people on campus runching! I don't runch. Sometimes I feel like I need to though! And I haven't tried any sports detergents. But I need to! I work 3 12 hour shifts/week about an hour from home, so I definitely do not runch! I let my workout clothes air-dry and do a workout load each week. Can I just say this detergent is amazing...? I only get 25 minutes for lunch, so running then isn't an option. I've tried WIN and love it! I am always afraid of having an odor after working out, so I can't do it during lunch. I would love to be able to get the stinkies out of the clothes. Haven't found anything yet but this might do the trick! I wish I runched. I have been walking with my little one, but I am always one the look out for new detergents. I'm fortunate not to Runch. I get the stink out by throwing the stuff that isn't gross into a laundry basket until there is enough for a washer load. If anything is really sweaty, I rinse it and hang it up to dry on shower bar and then throw it in laundry pile. I don't runch (too short of a time to run! ), but I do tend to let my workout clothes air-dry before I was them. I think that helps so they aren't sitting and getting grosser. Nice post. Really enjoyed reading it from start to finish. Please visit my workout clothes page and leave comments.